Global meat consumption increases by 3%, decreases by 1% in the U.S.
One of the daily publications I subscribe to is MeatingPlace. If you are interested in getting daily updates on meat industry happenings, then this publication is for you. Recently MeatingPlace reported about meat consumption trends, as released by Euromonitor International: Encouraging results for the fresh meat industry. – A 3% increase in the global meat market from 2014 to 2015, growing to reach 225 million tones. Anastasia Alieva, Head of Fresh Food Research, attributes this growth to increased prosperity and rising populations. She indicates since 2009, India’s annual disposable income has increased by 95% and meat consumption increased by nearly 50% during the same time period. – Poultry is the most popular meat in the world, increasing by 4% in volume to reach 85 billion tones in 2014. – India, where 1/3 of the population is vegetarian, emerged as the top growing meat market in the world in 2014. – In China, demand for beef and veal increased by 5%, where demand for pork increased by 3% in 2014. Again this is attributed to an increase in per capita disposable income. 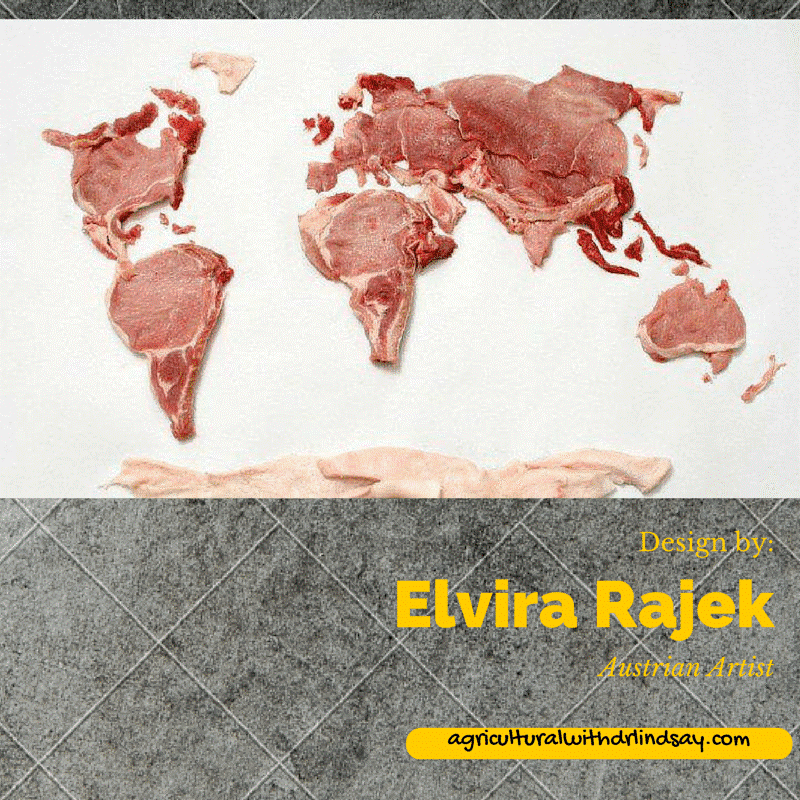 – Meat demand decreased in some developed markets. – Greece experienced the most severe decline of meat consumption in 2014, followed by Germany and the Netherlands. – Meat consumption in the U.S. decreased by 1% in 2014. This is attributed to health concerns, ethical, sustainability, and religious issues that portray meat in a negative light. Additionally, more Westerners are trying vegetarian, vegan, pescetarian, flexitarian, or vegetable oriented diet. – Lamb and goat consumption is increasing due to the rising interest of exotic and rare meats, as well as the popularity in Middle Eastern cuisine. This research indicates that in developed countries, poultry has become certer of the plate for many consumers at the expense of red meat. Oppositely, in developing countries, consumers are seeking out higher priced, red meat in favor of pork or poultry. Chipotle: There Is NO Pork Shortage! I am reblogging this from Wanda at Minnesota Farm Living. Wanda is a pig farmer, and has tremendous experience and expertise when it comes to pigs and the pork industry – so this article is coming from someone who raises our food. Chipotle has declared a pork shortage because their supplier was not compliant with pig housing requirements. Find out why housing pigs indoors is humane. via Chipotle: There Is NO Pork Shortage!. 2. 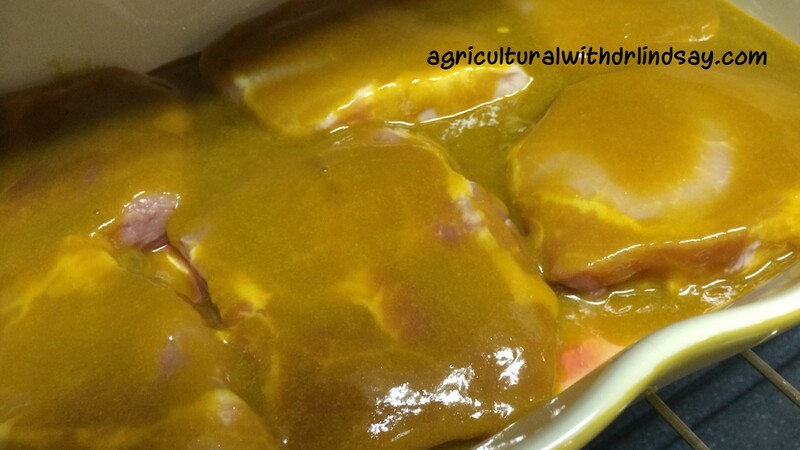 Place pork chops in a single layer in a baking dish and cover with the brown sugar/mustard sauce. Do not add any additional water to the pan. 3. Bake at 350 degrees F until done (check them at about 25 minutes). Use a meat thermometer to test their doneness. Remember pork chops only need to be cooked to 145 degrees F! 4. 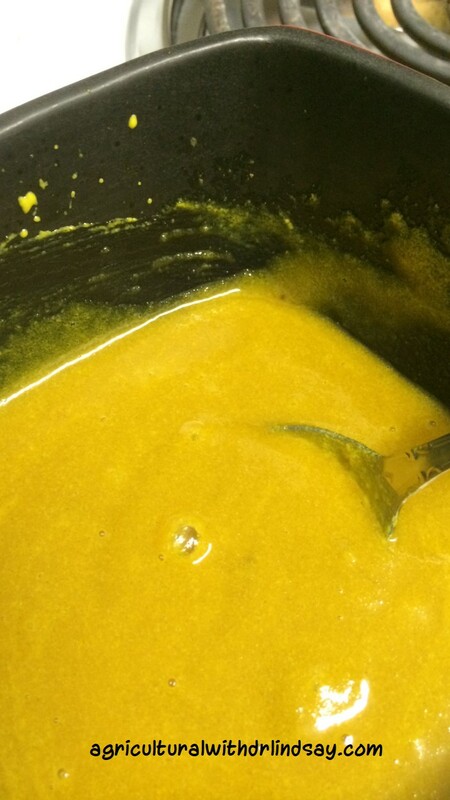 Drizzle some sauce (aka delicious goodness) over your chops when served. 5. 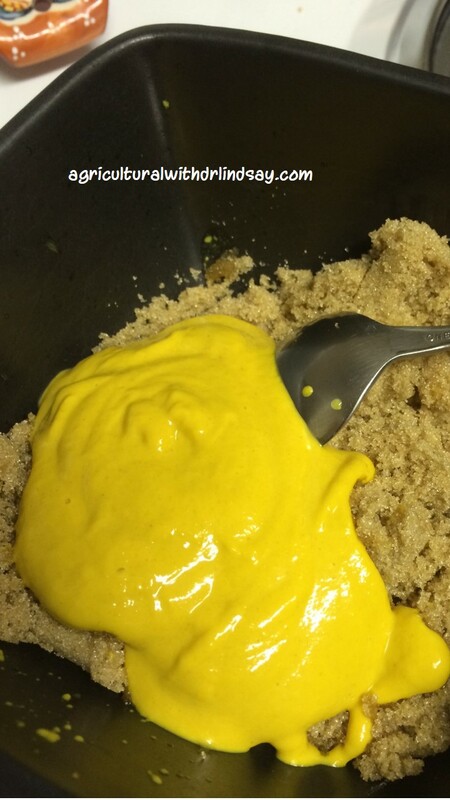 Serve with your favorite sides – enjoy! I am also trying out another delivery method – video demonstrations! Watching yourself on camera is like hearing your recorded voice, kinda weird. Certainly not perfect…my videographer (aka the hubs) and I both need a little work, but that will come with time. 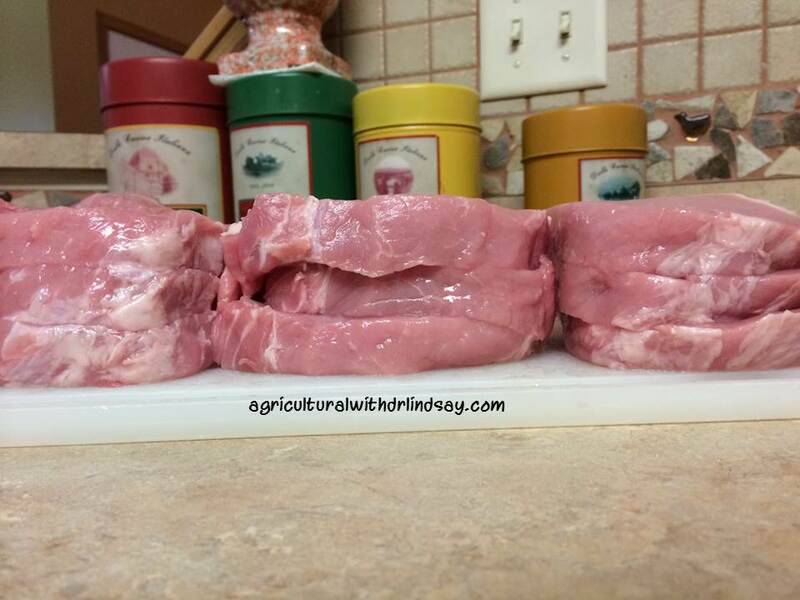 Today I want to show you how to take a bulk meat item and break it down into individual portions. 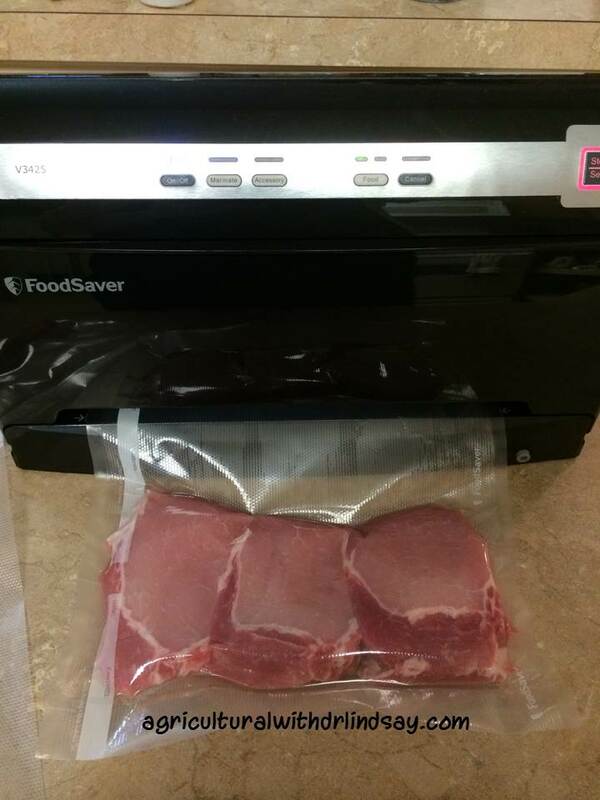 In this example, I use a pork loin. 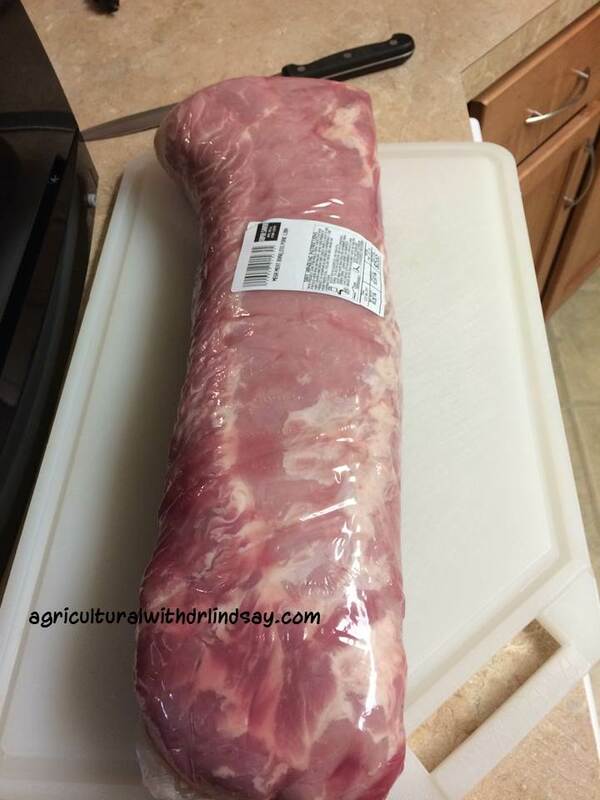 Pork loin from a local retailer. 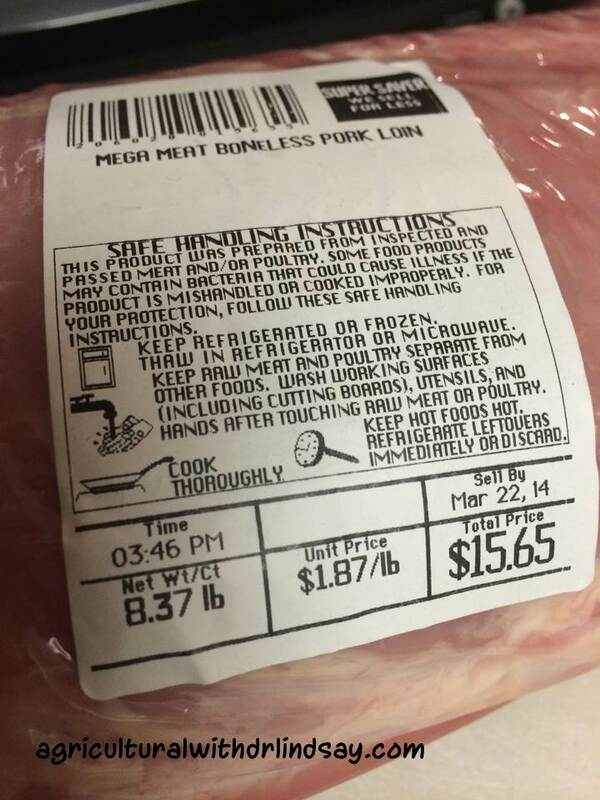 Sometimes buying meat in bulk can give us sticker shock since a lot of money can be spent quickly. But keep reading to see how many portions I made for the hubs and I. Remember to make sure all of your work surfaces, utensils, and hands are clean. Food safety is always important to practice. Also, notice how the cutting board I am using has the groove around the outside edge, this is great for cutting meat as it catches all of the juices, and helps keep your work space much cleaner. 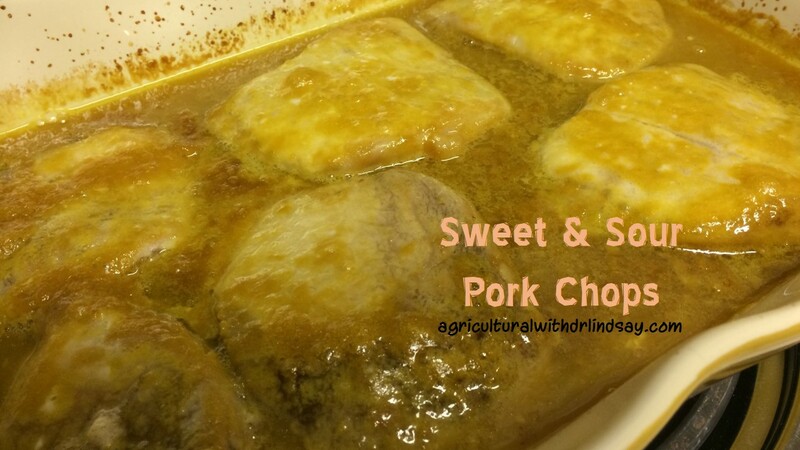 Pork chops! Using your knife to measure thickness works great for keeping all of the chops consistent in size. Prepare your bags. I like to make them all at once. I fold down the top before I put the meat (or anything else) in. Folding helps the top of the bag stay clean, ensuring a good (non-leaking) seal. 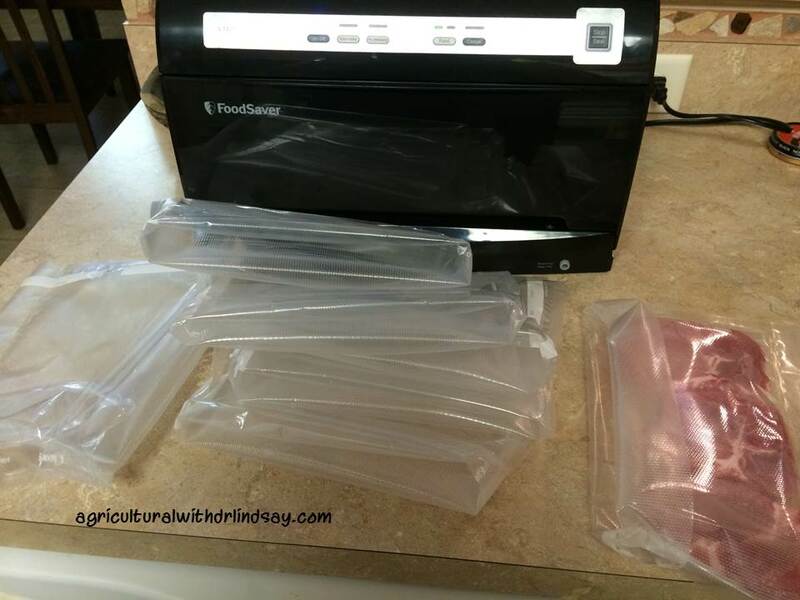 FoodSaver doing its thing…the package should be air free. As a recap, I paid $15.65 for an 8.37 pound pork loin. I was able to package it for seven meals for my family size (the hubs and I). Each package, or meat that will be on our plate for seven meals cost $2.24 per meal! Or if you really want to break it down that is $0.75 per pork chop! To me that is a heck of a deal. The convenience of the cut chops and in individual portions also fits great into my crazy schedule . As a reminder, the internal cooking temperature of a pork chop is 145 degrees F, the same as it is for beef, veal, and lamb (this can be measured with a meat thermometer inserted into the center of the chop). One of the quickest ways to have a bad eating experience is to overcook your meat! My mantra when grilling is low and slow; the meat reaches the ideal degree of doneness without burning the outside. 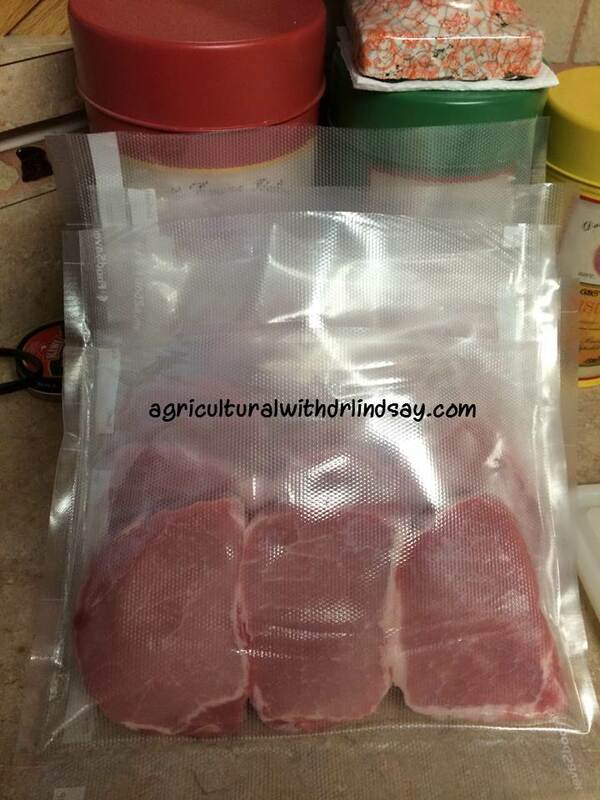 Do you buy meat in bulk and portion it out? What great tips can you share with me? ** Note: I am not promoting one brand over another. I use what I have, what works for me, and what I have had good luck with.